I am doing a series of posts on the "Mormon Moment," on my personal blog. (My original post focused on the policies of the LDS church, and included the issues around the Prop 8 election in California, which has already been more than covered here on this website, so I won't go into all the details again.) 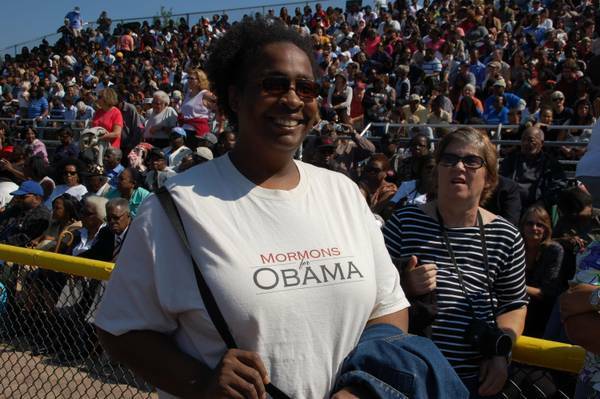 Most people assume that the cultural bias towards the Republican party by many members of the LDS church is doctrinally based. As a recent post on my personal blog addresses, culture and doctrine can be tricky for members of the church to sort out. For those who are not LDS, it can seem downright convoluted. I hope that this post and its sources help to clear up some of these distinctions in regards to politics. Most of the time, the LDS church stays out of political races and referendums, and it releases only general statements on issues that relate to church doctrine. Church leaders do not tell members how to vote or ask for them to reveal how they voted. The only constant doctrine taught about the responsibility of church members consists of asking their members to be active citizens who intelligently vote their conscience. The official church position regarding politics can be found in the Articles of Faith, the Doctrine and Covenants, and also the Official Church Handbook 2, which is available online at LDS.org. The Articles of Faith and Doctrine an Covenants are canonized LDS scripture, while the Official Church Handbook is a manual with instructions for how to administer the day-to-day functions of a LDS congregation and life. 11. We claim the privilege of worshiping Almighty God according to the dictates of our own conscience, and allow all men the same privilege, let them worship how, where, or what they may.12. We believe in being subject to kings, presidents, rulers, and magistrates, in obeying, honoring, and sustaining the law. 20 Let no man think he is ruler; but let God rule him that judgeth, according to the counsel of his own will, or, in other words, him that counseleth or sitteth upon the judgment seat. 21 Let no man break the laws of the land, for he that keepeth the laws of God hath no need to break the laws of the land. 22 Wherefore, be subject to the powers that be, until he reigns whose right it is to reign, and subdues all enemies under his feet. Doctrine and Covenants 98: 7-10 elaborate further when it explains why good political leaders are important, and why being actively involved in choosing good leaders, (when living in a place where citizens have the chance to be involved in choosing their leaders) is important, and keeping bad leaders from governing is a sacred responsibility. This means that Mormons start with the foundational understanding that as members of the LDS church we have an obligation to obey, honor and sustain the laws of the land, even when we don't agree with specific political leader(s) or a particular law. We recognize many forms of government, not just democracies, as being viable and acceptable in the eyes of God. We may claim that the Church of Jesus Christ of Latter-day Saints is the one true church, but we respect the right of others to believe and worship differently. We can share our religious beliefs, but every person on the earth has the right to believe or not to believe in God. Every person has the right to worship in ways that are consistent to their beliefs, even if we do not understand, agree, or approve of those religious practices. Every government has the expectation that Mormons who are citizens will follow and uphold the laws of their land, no matter the specifics of how that government functions. 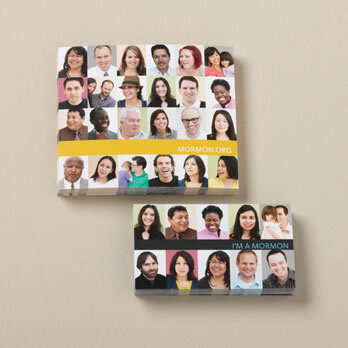 The Official Church Handbook has several areas that speak about the responsibility of LDS members in relation to their government, regardless of where in the world those members live. This is a sampling of the sections that are important within the framework of the current election in the United States of America. Church members are obligated by the twelfth article of faith to obey the tax laws of the nation where they reside (see also D&C 134:5). Members who disapprove of tax laws may try to have them changed by legislation or constitutional amendment. Members who have well-founded legal objections may challenge tax laws in the courts. Church members who refuse to file a tax return, pay required income taxes, or comply with a final judgment in a tax case are in direct conflict with the law and with the teachings of the Church. Such members may be ineligible for a temple recommend and should not be called to positions of principal responsibility in the Church. Members who are convicted of willfully violating tax laws are subject to Church discipline to the extent warranted by the circumstances. Members should obey, honor, and sustain the laws in any country where they reside or travel (see D&C 58:21–22; Articles of Faith 1:12). This includes laws that prohibit proselytizing. As citizens, Church members are encouraged to participate in political and governmental affairs, including involvement in the political party of their choice. Members are also urged to be actively engaged in worthy causes to improve their communities and make them wholesome places in which to live and rear families. In accordance with the laws of their respective governments, members are encouraged to register to vote, to study issues and candidates carefully, and to vote for individuals whom they believe will act with integrity and sound judgment. Latter-day Saints have a special obligation to seek out, vote for, and uphold leaders who are honest, good, and wise (see D&C 98:10). While affirming the right of expression on political and social issues, the Church is neutral regarding political parties, political platforms, and candidates for political office. The Church does not endorse any political party or candidate. Nor does it advise members how to vote. However, in some exceptional instances the Church will take a position on specific legislation, particularly when it concludes that moral issues are involved. Church members are encouraged to consider serving in elected or appointed public offices in local and national government. Candidates for public office should not imply that their candidacy is endorsed by the Church or its leaders.Church leaders and members should also avoid statements or conduct that might be interpreted as Church endorsement of any political party, platform, policy, or candidate. Members are encouraged to support measures that strengthen the moral fabric of society, particularly those designed to maintain and strengthen the family as the fundamental unit of society. Church records, directories, and similar materials may not be used for political purposes. Church facilities may not be used for political purposes. However, facilities may be used for voter registration or polling where there is not a reasonable alternative (see 21.2). I don't mind talking about my political views, but I don't talk about politics while at church, period. We have so many cultural biases towards blindly voting Republican within the Church, that I usually find that other church members might not appreciate me trying to explain the complex layers of grey that go into the fact that I vote for both Republicans and Democrats. Many become defensive when I explain my process, and how I research to pick the candidate who I think is best for the job. Since I can't say, "I am a (fill in a political party)," I keep my politics out of my worship. In this presidential election, I have already voted for Barack Obama. My choice in voting is really two-thirds a vote for Obama, and one-third of a vote against Mitt Romney. I didn't think I would be voting against Mitt, (if he ever was on the ticket) when he was running back in 2008. Then I saw him as a real possibility of a moderate Republican who had a record of putting together solutions that work. He did some impressive things getting the Olympics back on track, and while Romneycare didn't go as far as I hope a national plan eventually will, the way he got it passed showed he could work with people who are not Republicans. This is was an improvement over Bush. That was 2008, and this year is 2012. 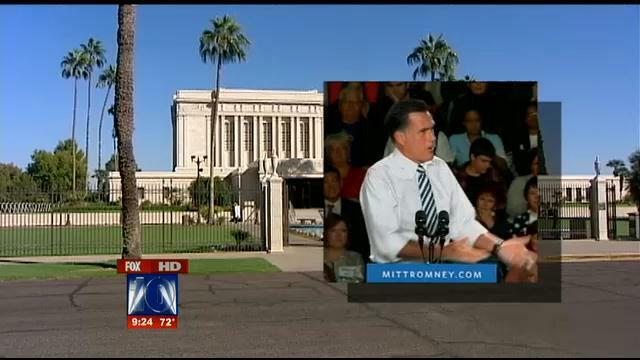 The Romney that I had respect for in 2008 does not seem to be around in 2012. His willingness to say ANYTHING to win does not sit well with me as a citizen, a Mormon, or a voter. Whether he believes all of the things he says or not, he can't mean everything he says, because he disagrees with himself over and over. Mitt's choice of Paul Ryan as a running mate was his final bad choice - made out of expediency, and this choice made it impossible for me to see him as the man I admired four years ago. That is why I am not voting for Romney, but the reasons I am voting for Obama are quite a bit more nuanced. Some of it is self-interest. I am on COBRA health insurance, and if Obamacare stands, I will be able to keep the very good insurance I have now. If I had to buy insurance on the open market, I would be uninsurable. In 2008, health care was one of my big issues, and Obama delivered on his promise to expand health care to many more Americans. My husband's company pays him well, and our income qualifies us as the lower end of the middle class. The Obama economic program will benefit us much more than the Romney/Ryan plan would. So selfishly, I get more benefits, even if I do pay more in taxes, if Obama is president for the next four years. I am not looking for a grand change in fiscal policy. I think President Bush did some unforgivable things to the economy, and we aren't anywhere close to having those items turned around. Obama hasn't been perfect, but I trust him to make the best choices he can, and to think about the middle and lower class as Americans, not a drain on the "real Americans." I am hoping that there will be enough pressure on the Republicans in Congress so that some work actually gets done, but I would rather have Obama get less done, than Romney getting most of what he says he wants to do. I trust Obama to find policy compromises that work. I can't see any Republican having the guts (or gonads) to go against the right-wing of the party, least of all Romney. Obama is my choice. He got my vote, and he got a $50 donation a few months ago. Obama also got the support of my kids, (without them knowing what I thought,) and they volunteer with their father and participate in the "Get Out the Vote Effort!" (Taking my children to political rallies, protests, and campaign events with politicians and political movements on both sides of the aisle has been an important part of educating them to be good citizens.) My children believe that Obama will give them the best future, and they are not your average preteens. When they laid out their reasoning for why they want Obama to be president for the next four years, I was proud to discover that their reasons were similar to mine. While I am the only one with the legal right to vote, my vote carried the hopes and dreams of my children when I mailed my ballot on Monday. Authors Note: My goal with the "Mormon Moment Series" has been to explain "Mormony" things to those who may be interested in learning about Mormonism. I include my experiences, and those of other bloggers, so I regularly have links to blogs I read and comment on, while I also link directly to official sources like LDS.org or other official church sites. In no way is this post meant to be an exhaustive study of the issues related to the LDS church and its policies regarding voting and elections. 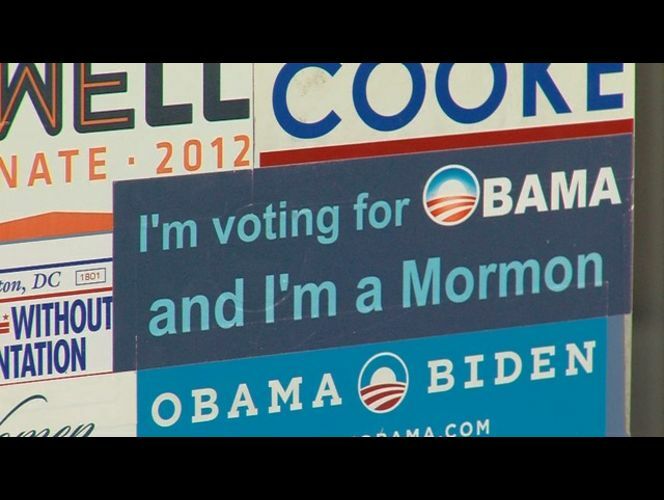 For those of you who would like to read my personal thoughts on Prop 8, or are interested in why I, and Mormons for Obama, always clearly state that we don't speak for the LDS church, you can read the rest of my original post here. If you are interested in a laugh, and understanding which policies were broken in the Gay Trees and Gadianton Robbers incident, you will also find that there as well. 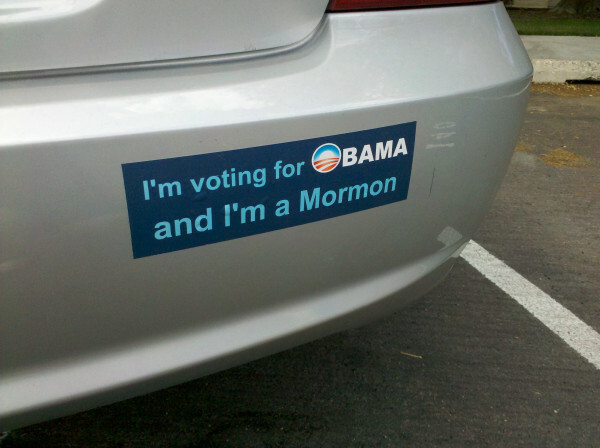 For another Mormon perspective posted yesterday, see Sarah Familia's great post on why she chose to vote for Obama. "The very basis of Mormon community, stretching back to the earliest years of Mormonism nearly two centuries ago, is that the more able have a sacred obligation to assist the less able. That sense of physical community was institutionalized in the Church's Welfare Program, which sprang out of the Great Depression as an exemplary and effective means of combining church and government assistance not only to give to those in need, but also to help them to help themselves . . . Judge Mitt Romney as you will, and vote for or against him as you will; but do not judge Mormonism on the basis of the Mitt Romney that was unveiled to the public this week. 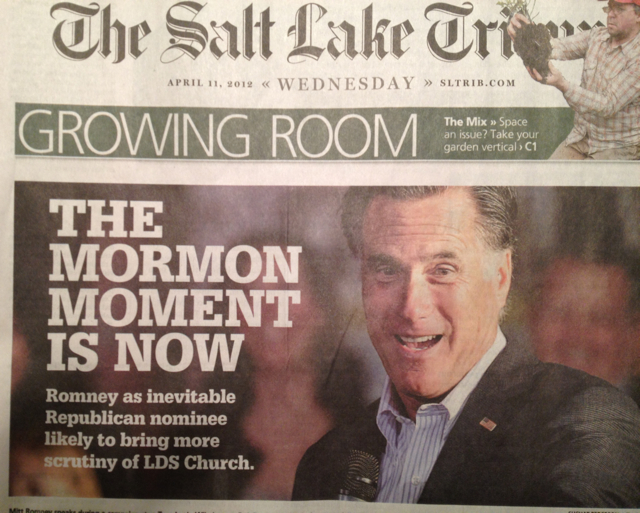 He is not the face of Mormonism." Dr. Prince was on the Lawrence O'Donnell show on MSNBC Thursday evening to discuss his column, Mitt Romney, and Mormonism. I encourage you all to watch it here.